Final Four preview : Will MSU prevent TT, UVA or Auburn from winning their first title ? Over the last twenty years, 2017 was the only Final Four where only one team had won an NCAA title in the modern era. It ended up with the only experienced team, UNC, winning it all. The same case happens this year with Texas tech, Virginia and Auburn trying to reach the Grail against Izzo’s Spartans who won only once despite nine appearances in the Final Four since 1999. 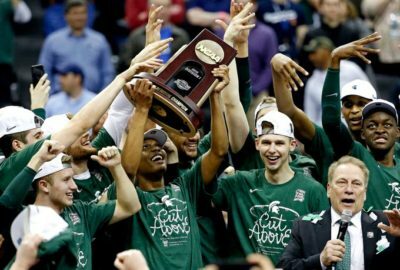 Can the big boys from Lansing bring Izzo another crown ? Will Texas Tech’s defense be too smothering for its opponents ? Is Virginia ready after last year’s choking in the first round ? How will Auburn be competitive without Okeke ? Forget last’s year desillusion, the Cavaliers have already reached a first goal by clinching a spot for the Final Four. The road was far from easy as Virginia almost fell to the same trap than last year as they trailed by 14 against Gardner-Webb before imposing their will in the second half. Then Oklahoma and Oregon were not able to prevent UVA from slowing down the temp with 51 and 49pts scored respectively. The challenge was different against Purdue and an unstoppable Carsen Edwards who scored 42pts. Fortunately, Diakite hit the buzzer and sent both teams to OT where Virginia finally beat the Boilermakers. With 29%, 27% and 33% from three in the last three games,Virginia will need to hit its shots from outside. Hunter, who has been disappointing thus far (10.3pts 4rbds 3/12 from threeover the last three games), will have to step up and benefit from Okeke’s injury. X factor Diakité (13pts 9rbds 2.2bl in the tournament) could also be a major contributor for the Cavaliers if he can score inside and create space for the shooters. By beating Kansas (43pts on 9/18 from three for Brown/Harper), UNC and then Kentucky, it’s hard to argue about Auburn’s presence in the Final Four. Yet, Okeke’s torn ACL was the worst that could happen as he was the main option inside for the Tigers. Despite Okeke’s injury, Auburn managed to beat Kentucky mainly thanks once again to Brown (24pts 4/7 from three) and Harper (26pts 11/11 FT) who were too much too handle for the Wildcats. To beat Virginia, Harper and Brown could watch how Edwards destroyed UVA’s defense by shooting from three as the Cavaliers’ pack line defense leaves a lot of space for shooters. They must also keep the pace as high as possible as they did in the last three games by scoring an averaged 87pts per game. The big men will need to step up also or at least limit Virginia’s frontcourt, above all Diakite who has brought a real threat in the paint. Prediction : Virginia has more weapons than Kentucky and will be hard to handle for the Tigers. The Cavaliers’ backcourt could also put more pressure on Harper and Brown as Auburn will lack a third offensive threat which should have been Okeke. Virginia wins it 72-65. After a rough start against Bradley in the first round where Winston and Tillman made the difference in the last ten minutes, MSU rode with two pretty easy wins against Minnesota and LSU by an averaged 18.5-point-margin to reach the Elite Eight and face tournament’s favourite Duke. While the game was decided by the shortest margin possible, MSU did a great job limiting Duke’s passing (14as and 17tos) while Winston (20pts 10as 4tos) was the man in what could be considered a bad game offensively for the Spartans (42% FG, 32% 3pt, 2/6 FT). If Winston (16.7pts 9as in the last three games) and McQuaid, the only guards in the rotation, can resist Texas Tech’s suffocating guards’ defense, the inside players should dominate the thin Red Raiders’ frontcourt. With Goins, Ward and above all Tillman (15.2pts 8.5rbds 1.7bl in the tournament), the Spartans have an edge in the paint which must help them control the rebound and score easy baskets. Freshmen forwards Henry (4.3as over the last three games) and maybe Brown (15pts on 4/6 from three against LSU) could be X factors by hitting their outside shots and facilitating the distribution of the ball inside. They could also be asked to defend on Culver’s length and prevent him from slashing for easy baskets. Defense has been the key for Texas Tech. By limiting Buffalo to 58pts, Michigan to 44pts and Gonzaga to 69, the Red Raiders has already been tested against some of the best offenses in the country. Mooney (13.5pts on 47% FG in the las two games) and Moretti (13.5pts on a combined 5/8 from three in the last two games) have been the perfect right hand men to Tech’s top 10 prospect. Jarrett Culver has been his usual self, displaying his versatility on offense (21.5pts 4.7as) but also on defense (6.7rbds 2.2st 1.3bl). Yet, his offensive efficiency still is a problem as he shot a combined 20/55 FG including 3/17 from three over the last three games. Inside, Owens has been solid with 9.5pts 7.8rbds and 2.5bl over the tournament. Texas Tech has one goal, destroying Winston’s hold on the game. Mooney and Moretti will be asked to handle this job and get Winston as tired as possible as the Spartans don’t have a solid back up PG to get him some rest. The aforementioned guards and Culver will also have to help undersized Owens and Odiase if they don’t want the Spartan’s big boys to score easy baskets inside as Clarke and Hachimura did in the previous game combining for 40pts and 18rbds. To get things easier, Culver needs to be efficient as the Red Raiders couldn’t probably handle another 5/19 from him.